Located in the town of Cervione, in the place called "Prunete", at 2 km away from the seaside resort of Moriani, the residence built in Mediterranean style, situated near the water, consists of 40 villas with 2 to 4 rooms all equipped with reversible air conditioning with terraces and private gardens. You can enjoy the heated swimming pool, a refreshment area and its magnificent sandy beach. The services at your disposal are to make life easier throughout your stay. The residence 'À NUCIOLA is composed of 40 air-conditioned villas with 2 to 4 rooms, located at the sea shore, equipped with a heated and secured swimming pool and having a direct pedestrian access to the beautiful sandy beach of Prunete (200m). The swimming pool was recently renovated (in 2016). Cervione, ideally located in Corsica, in the heart of the Costa Verde, offers the opportunity to enjoy all the delights of this region bordered by 17 km of fine sandy beaches. You will discover plenty to see and do: its beaches with gentle slopes ideal for children, the thrill of extreme sports, there is something for everyone in this area with unexpected richness. Offering areas with pure and invigorating water, the site attracts not only swimmers, but also lovers of canyoning and climbing. Discounts on some activities like kayaking, mountain biking, diving courses, boat license ... at the marina! This 4 room villa is suitable for up to 8 persons and has an area of around 58 m². The living room is furnished with a sofa bed and flat screen TV. 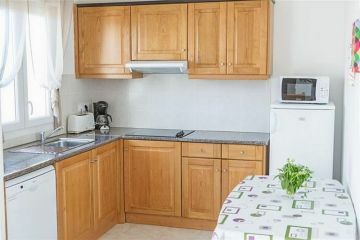 The kitchen is fully equipped (fridge, electric hob, microwave, dishwasher). The accommodation has three bedrooms: one with a double bed, and two with 2 single beds each, a bathroom with WC and a separated WC, a furnished terrace and a private garden.